Roll out and save the day! Your little hero can race to the rescue with this brightly colored Mega Bloks Police Car Vehicle. Get ready to help friends in need when you sit the police officer Block Buddy at the wheel and add the red and blue blocks to the top of the car to get your siren going. 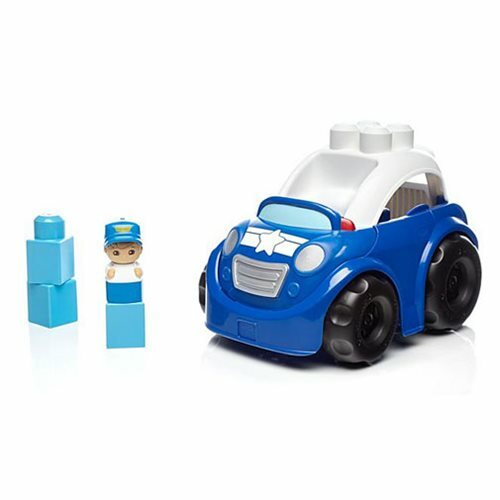 Made for little hands and growing minds, you can stack the big building blocks right onto the police car's roof, or create anything else you imagine, building creativity and motor skills along the way! When this rescue adventure is over, open the police car's roof to store all the blocks inside for quick and easy cleanup. Includes 6 pieces. Ages 1 to 5.